Tens of thousands of Armenians living around the world flocked to solemn memorials and defiant protests on Friday to mark the 100th anniversary of the Armenian genocide. The ceremonies mark the period in 1915 when Armenian intellectuals were rounded up in Ottoman-era Turkey, presaging a wave of killing that left about 1.5 million people dead. Historians consider the massacre to be the first genocide of the 20th century. Turkey denies that the killings constituted genocide, and has reacted angrily to recent moves in Europe to recognize it as such. But Armenians around the world have vowed to preserve the memory of those killed. On Friday, they held commemorations in cities around the world, from Moscow to Marseille. The Armenian diaspora is estimated to number 7 million to 10 million people, with significant populations in Russia, France and the U.S. The Russian and French presidents joined other world leaders Friday at a commemoration ceremony in the Armenian capital of Yerevan on Friday. The U.S. government this week rejected calls to recognize the killings as genocide. In Jerusalem and Tehran, Iran, some Armenians protested outside the Turkish embassy and consulate demanding that Turkey recognize the slaughter of their ancestors. "Denial of genocide... is the opening gate for another genocide," Inon Zalcman, a member of The Combat Genocide Association, told The Associated Press in Jerusalem. At the former prison in Istanbul where the Armenians were held in 1915, a small group of protesters held red flowers and portraits of the intellectuals detained 100 years ago. "They thought no one would remember the victims or the perpetrators, that it would be buried," Serge Tomassian, an Armenian who had traveled to Istanbul from California told Reuters. "What's happening today proves that's not true." 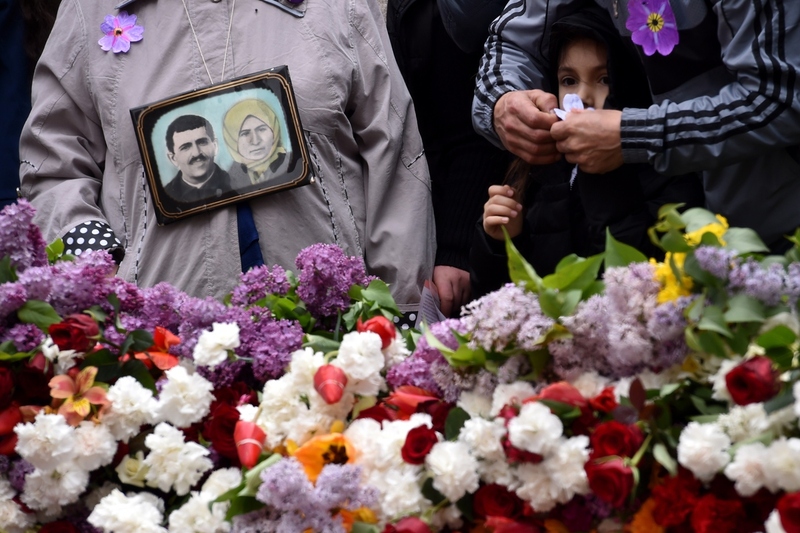 People attend a flower-laying ceremony at the Tsitsernakaberd Memorial, in Yerevan, Armenia on April 24, 2015.